What makes us shrink back or hold back? When I’m hanging out with my wisest friends (who are 70 years and older), I notice a common occurrence: they are less affected by circumstances. They carry an acceptance about where they are, who they’re with and what they’re doing in that very moment. All that matters is now. And in that now moment, they are real, true to themselves, honest, present, sincere and worry-free. Innovators are such a gift to the human race. If you’re an innovator, stand tall. You have a greater purpose than simply coming up with new and exciting ideas. Innovators seem to have the least amount of struggle with falsity. In my opinion, they are uncompromising people. They seem to not invest a lot of their energy in what other people think. They are unapologetic for their opinions, actions and convictions. Ok sure, some innovators are difficult to work with and have peculiarities that might occasionally drive us crazy, but wouldn’t that simply be their unique style, not a flaw in their character? I am a fortunate woman because my clients are primarily innovators. They are a gift to my journey. Though they may identify with my moments of worry, they have the boldness to spit on worry and carry on. Let me speak to the heart of an innovator for a moment. If you’re one of them, this is what I think of you. You remind us to stay the course. 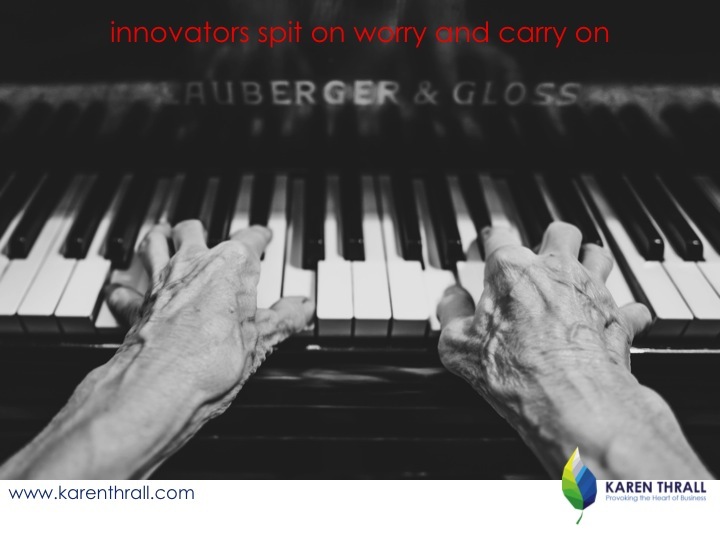 If you’re an innovator, part of your purpose is to inspire us to walk in our true self, worry-free. Those are big shoes to fill, but you’re the people that can fill them. When I’m with an innovator, it’s amazing how quickly nothing matters. What worried me, no longer has power. The world is full of options. How can we possibly accomplish anything if we worry? Worry breeds falsity. Possibilities diffuse worry. Innovators understand this.